In November of 2017, we celebrated a major victory in our fight against fossil fuels in Washington State: the City of Tacoma adopted interim regulations preventing new fossil fuel infrastructure on the Tacoma Tideflats (a region which includes the Port of Tacoma). Together with the Protect Tacoma’s Tideflats coalition, we urged Councilmembers to put the health of Tacomans first by taking this proactive step as the city embarks on a long-term planning process for the Tideflats. The decision followed other efforts by Northwest municipalities, including Whatcom County and Portland, Oregon, to implement protective land use regulations that limit new fossil fuel projects. As of the spring of 2018, the City and Port of Tacoma, the Puyallup Tribe, and Pierce County are developing an Interlocal Agreement that kicks off this planning process. The process will take several years, and we will remain engaged in public oversight opportunities. 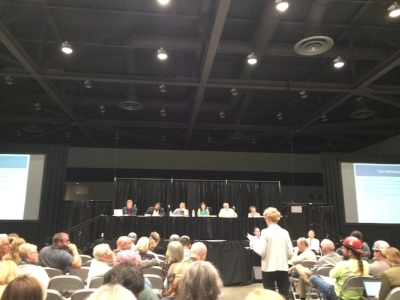 Dr. Margaret Kitchell, a member of WPSR's Climate & Health Task Force, testified to the Tacoma Planning Commission in support of interim regulations to prevent new or expanded fossil fuel infrastructure in the Tideflats.